I quite often send out an email to friends and acquaintances in the ham radio hobby, with links that I have come across. I've started to realize that it would be good if I would capture this research on-line, where I don't have to go back and hunt through my outbox to figure it out. So this is it. I will try and go back and find the previous emails and cut and paste them to this page. I made this antenna mod a while ago so all I have is what's on my website. I made the 80 m coil out of sewer pipe with top and bottom caps. I used a metal plate approx 2" dia with a SO 259 socket and the base has a die case box with a u clamp to the bull bar. The die cast box can be opened from underneath. i.e. screws pointing down to the road. Keeps it tidy and enables you to work on it and cables come out a hole at the bottom. The relays are in the top and bottom of the coil. Watch for spacing as there are very high voltages even on 100watts. Remember you are only using the entire ATAS 120 antenna as the top section of the 80 metre coil otherwise it works as a normal ATAS antenna. 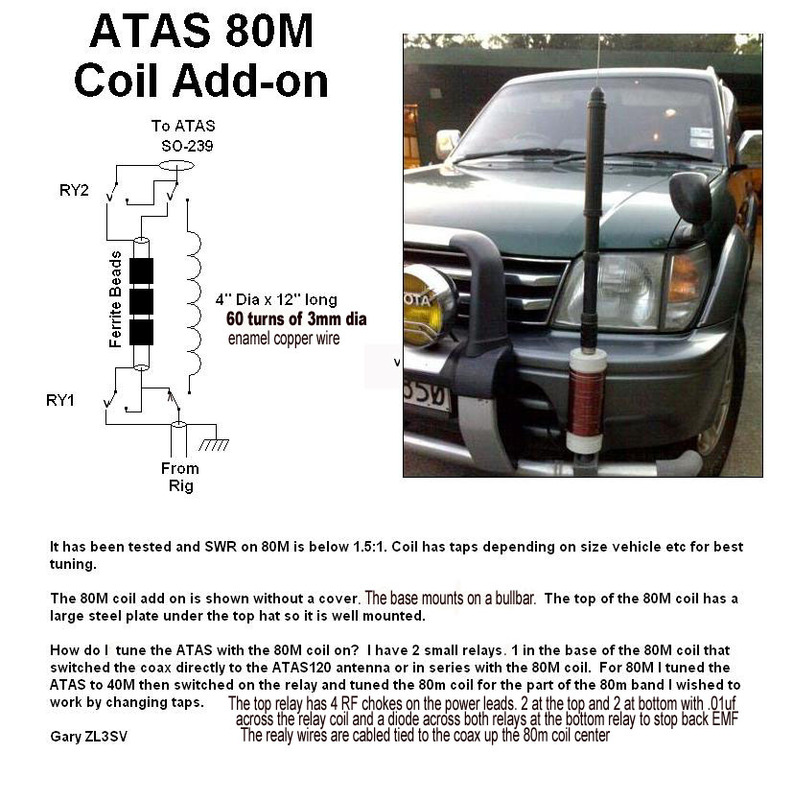 Changing the freq of the ATAS antenna from say 40M to 10 metres has a fine tune effect on 80 when the 80 coil is circuit. http://www.youtube.com/watch?v=_Rth8FWBJFY Now this is an awesome remote station! http://kc.flex-radio.com/KnowledgebaseArticle50065.aspx DDUtil provides the automation required to decode and present transmit frequency data to select frequency sensitive devices such as linear amplifiers, antenna controllers (SteppIR), antenna tuners, antenna band switchers, etc. DDUtil may be used in a stand-alone mode or with up to four (4) Radio Control Programs (RCP) running simultaneously. For example it will band switch a Yaesu Quadra and PW1 amplifiers, a SteppIR antenna controller and a Palstar AT-Auto tuner all at the same time. If you want to run a radio control program such as HRD or DXLabs or MixW it will change modes and pass all commands from the radio control program to PowerSDR and still provide the passive listener devices frequency data. http://www.mini-box.com/PW-200M-DC-DC-power-supply?sc=8&category=13 12 volt power supply for ATX motherboard – 200 watts - so if you want to build a computer to run off of battery power – this is it!